472 pages | 60 B/W Illus. This book deals with the central question of how human factors and ergonomics (HFE) might contribute to solutions for the more sustainable development of our world. 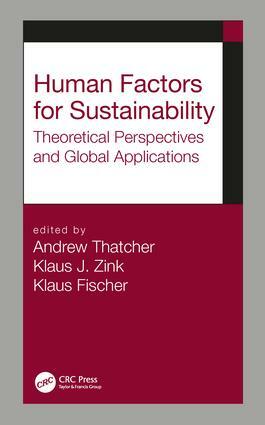 The contents of the book are highly compatible with the recent political agenda for sustainable development as well as with sustainability research from other disciplines.The book aims to summarize and profile the various empirical and theoretical work arising from the field of “Human Factors and Sustainable Development” in the last decade. The book gives a systematic overview of relevant theoretical concepts, their underlying philosophies, as well as global application fields and case studies. Introduction to Sustainability and HFE. How has HFE Responded to the Global Challenges Posed by Sustainability? What is the Ultimate Purpose of HFE? Quality of Life, Quality of Work Life and Decent Work. HFE and the Global Goals for Sustainable Development. The Role of HFE in the National Academy of Engineering Grand Challenges. How Sustainability Changes the Values and Ethics of HFE. Sustainability in the Context of Developing World Problems. Methods and Application Areas for Sustainable Work Systems. Social Lifecycle Analysis. Ergoecology and Product ‘Lifecycles’. Applying Sustainable System-of-Systems for HFE. Applying Participatory Approaches for Sustainability. Sustainability, HFE and Organizational Behavior. Sustainability of Global Value Creation and Supply Chains. Crowdwork, Outsourcing and Sustainable Work Systems. Corporate Sustainability and Lean Manufacturing. Case Studies from Around the World on Sustainability and HFE Work Systems. Complex Inter-related HFE Problems: Case of the Persian Gulf. Social Sustainability in the Chilean Forestry Industry. Integrating Social, Cultural, and Environmental Sustainability – the Case of the East Cape Community in New Zealand. Sustainable Development and Energy Systems Design: Overview and Prospective thinking from a Francophone Perspective. “Shut the Fridge Door”: Using Socio-Technical Work Redesign to Improve Energy Efficiency in Supermarket Retail Stores. Prof. Andrew Thatcher has a PhD in cognitive ergonomics and is Chair of Industrial / Organisational Psychology at the University of the Witwatersrand. He is currently the chair of the International Ergonomics Association’s Technical Committee on Human Factors and Sustainable Development. Broadly his research looks at understanding sustainable work systems with a particular focus on ecological systems. His research focuses on the psychological factors in the adoption of sustainable technologies, health and wellbeing in "green" buildings, and applying theoretical ecological models to complex human systems. He was the ergonomics expert on the World Green Building Council’s working group which looked at health, wellbeing, and effectiveness in green office buildings. He also sits on the editorial board of several ergonomics journals and is currently an editor for the journal "Ergonomics". Previously he was an associate editor of the journal "Behaviour & Information Technology". From 2014-2017 he was President of the Ergonomics Society of South Africa. Prof. Zink is scientific director of the Institute for Technology and Work (German acronym: ITA) at the University of Kaiserslautern. In a great number of books, essays and articles he discussed concepts for the development of work and organisations and impacts on the quality of work. He is member in numerous national and international committees and on the Editorial Board of several journals. From 1994–2001 he was on the board of the German Human Factors and Ergonomics Society (GfA), 1997-1999 as President and 1999–2001 as Past-President. From 1995–2000 and 2004–2009 he was a member of the Council, 2000–2003 a member of the Executive Committee, and 2009–2012 Vice President of the International Ergonomics Association (IEA). He received the IEA Fellow Award in 2000, the Human Factors and Ergonomics Society (HFES) 2006 Distinguished International Colleague Award, and in 2009 the IEA "Ergonomics Development Award". From 2009–2015, he was chair of the International Ergonomics Association’s Technical Committee on Human Factors and Sustainable Development. Prof. Klaus Fischer is lecturer for Business Administration, in particular Sustainability and Strategic Management at the FOM University of Applied Science in Mannheim (Germany). Since his studies of industrial engineering and management, he is working on publicly-funded and industrial research projects in the fields of sustainable supply chain management, corporate sustainability and sustainable development at community level. He holds a PhD in economics, dealing with "corporate sustainability governance" and is searching on the topic of legitimacy and effectiveness of sustainablity management approaches and governance processes. He supported the formation and development of the IEA Technical Committee "Human Factors and Sustainable Development" since its foundation in 2008.